News articles allow store admins to inform customers of special events, changes, additions, or anything else you wish to communicate to your customers. From this page, you can click 'Add New' to create a new article (see below for details) or click an existing article to view/edit it. Select Locale Choose a language from the dropdown to assign the text you're creating to. See here for more information on locales. Headline This is the title of your news article. It will be shown in the 'Store News' section on your home page (see below) and on the main news page. News Copy This is the main text of the news article. 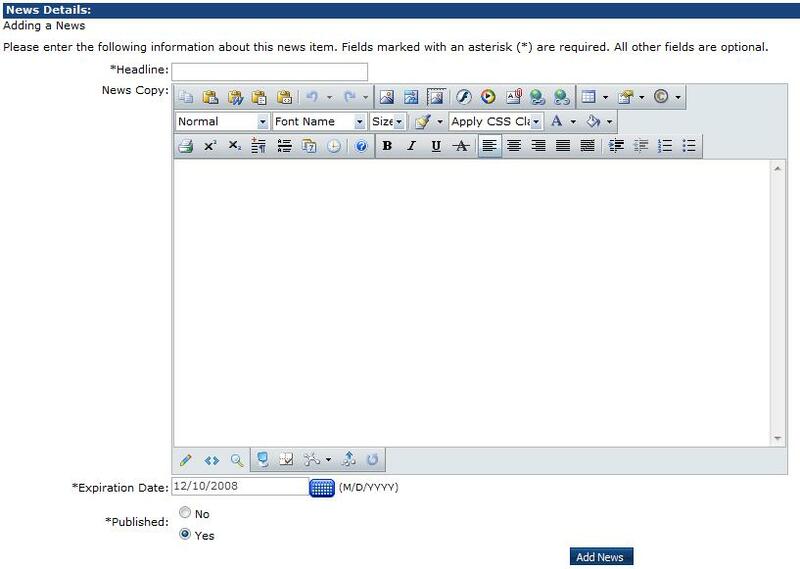 The content is entered through the Telerik RAD editor, and can accept HTML. This will only be displayed on the main news page. Expiration Date Enter the date you wish the article to stop displaying on your site (defaults to one month from creation). If the article should always display, set this date far in the future. Published Determines whether or not this article will appear on the front end. If news articles exist, a special 'Store News' section will display on the store's home page, with the dates and headlines of current news articles. Customers can click on a headline to be taken to the main news.aspx page, where the full text of the articles is visible. These AppConfigs allow store admins to change the functionality of the news feature. DoNotShowNewsOnHomePage If this is set to true, the 'Store News' section will not display on the store home page, even if news article exist.